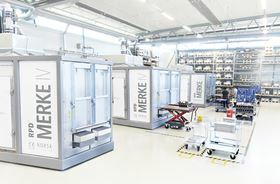 Norsk Titanium AS, a global supplier of additive manufactured (AM) titanium components, has received US$25 million funding to expand its aerospace AM operations. The funding includes US$10 million equity investment from Insight Equity Holdings LLC, a mid-market private equity firm, US$10 million growth debt facility from Harbert European Growth Capital Fund I (HEGCF) and US$5 million equity investment from a number of smaller investors. The $25 million funding round follows the inclusion in the 2016 New York State budget of US$125 million to support the development of Norsk Titanium’s Plattsburgh, New York factory, which is part of the company’s proposed US$1 billion, 10-year project in the state. This story is reprinted from material from Norsk Titanium, with editorial changes made by Materials Today. The views expressed in this article do not necessarily represent those of Elsevier.